Twitter just like any other social network out there enables email notifications for its users by default. What this means is that you will get emails in regular intervals about things happening on the network. Twitter divides those information into activities related to you and the tweets you make, to your retweets, network activies, and updates from Twitter. While you may be interested in some of the information, you may not like some of the notification that you receive. And if you hang out on Twitter or use one of the mobile apps of the service regularly, you may not need email notifications at all. Twitter uses a sophisticated system when it comes to email notifications. You can turn off all notifications if you want, or only some that you are not interested in. On top of all that, it makes use of a smart notification system by default which tries to reduce the number of emails that you receive. Visit the notifications page on Twitter. You can load this link directly https://twitter.com/settings/notifications or open Twitter manually, click on the options icon at the top right, select settings from it, and then email notifications. Sign in to your account if you have not done so already. Click on the turn off button to disable all email notifications. Click on the save changes button at the bottom of the page afterwards. If you do not want to disable notifications by email completely, you can at least go through the individual email options to disable the ones that you have no interest in. 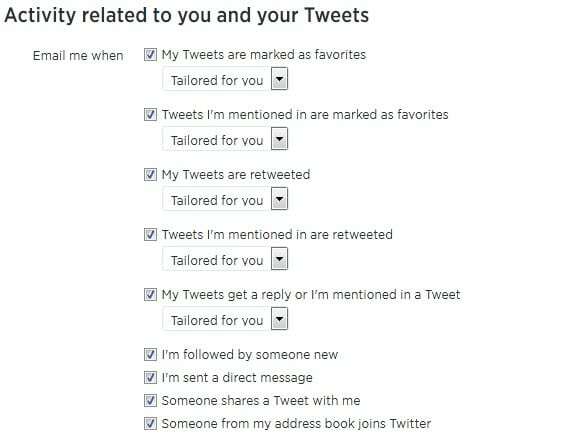 If you do not want to receive update from Twitter for instance, you can disable those completely by unchecking all options listed under the "updates from Twitter" section on the page. The same is possible for tweet, retweet and network activities. It is interesting to note that you can customize each notification section individually. The "activity related to you and your tweets" section for instance lists nine different notification options. Here it is for instance possible to disable notifications when someone follows you, but keep receiving notifications when you get a direct message on Twitter. You can turn on all or some email notifications again at any time by reversing the changes that you have just made. How to turn off all or some email notifications on Twitter. I turned them all off, couldn’t understand why I was still receiving email from Twitter, turns out there was more ticked then I though. Even though I remember disabling them, they must of added more since the last time I was in their.